Construction Services East London Ltd is a distinguished roofing contractor based in Essex. We offer a wide range of services capably carried out by our qualified and experienced tradesmen. We have built our reputation based on quality workmanship, attention to detail and reliability. Over seventy five percent of our work comes from recommendations. For decades, we have offered traditional roofing systems such as tiling, slating and felt roofing. In more recent years, we have become leaders in Single ply roofing, and also provide and lay the latest environmentally friendly brown and green roofing systems. For all jobs, we provide only the highest quality advice and service to our clients. Throughout our combined 60 years experience, we have always prided ourselves on our quality, reliability and personal contact with clients, a service which is still the mainstay of our business. We offer a professional service with all our roofing works guaranteed, fitted by fully trained operatives, committed to customer satisfaction and high quality service. Roofing assessments are free of charge supplying you with a detailed specification of work requirements tailored for your individual needs, including a complete quotation of cost. Being based just East of London our company is ideally situated to serve London and the Home Counties. Please feel free to contact us for a no obligation consultation and quotation or for any further information. 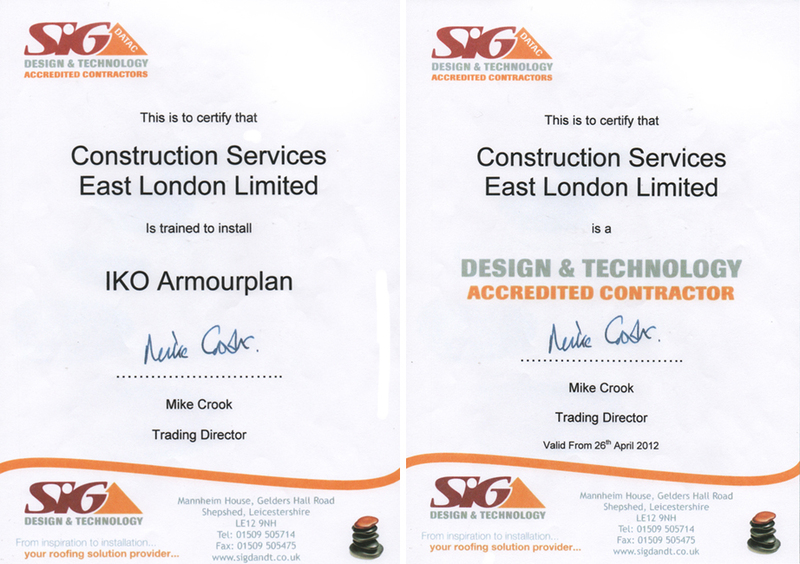 Here are our certificates to show we are SIG Design and Technology Approved contractors and that we can install IKO Armourplan. CSEL Roofing has extensive experience. Visit our gallery to view recent roofing projects carried out in London and the Home Counties.